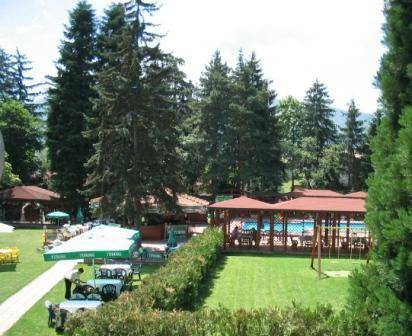 Holiday Village Diplomat is part of Diplomatic Club Gloria Palace in Sofia, the capital of Bulgaria, which area is more than 25 hectares. The hotel disposes with 10 villas, 5 standard rooms and 3 apartments. Sport facilities are available such as tennis courts / red clay and synthetic grass; in- and outdoor/, outdoor swimming pool, fitness, sauna and massage. The exceptional environment of 60 tree species and large green fields are distinguishing the hotel from the typical city hotel. Restaurant with barbecue garden and children playground, coffee shop and Caribbean bar are indulging les gourmands". 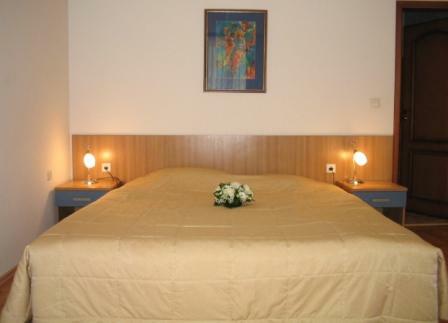 The hotel is located on the first ring road of Sofia city, about 10 km away from the city centre. The distance to Sofia airport is approximately 17 km. A bus station /bus number 260 - direction to the city centre/ are 3 min walking distance from the hotel. Train station is 10 min away by foot and the bus station /to other cities and Rila monastery/ is three bus stops away from the hotel. In a proximity to the hotel is the Boyana Church, Dragalevski monastery, ski lifts to Vitosha Mountain and the National Historical museum. 4 red clay tennis courts /open all year around/, 2 synthetic grass tennis courts, outdoor swimming pool, park area, barbecue garden, Caribbean bar, Restaurant, Conference and meeting rooms, fitness, sauna and massage. The houses are spread out over two floors, designed with high quality fittings and totally gas supplied. On the first floor there is a cozy living-room with a leather sofa and a dining corner, satellite TV, telephone with a possibility for an Internet connection, mini-bar, air-conditioning system and a luxury bathroom. On the second floor there are two bedrooms and another bathroom with a hair-drier. Each house disposes with a private inner courtyard . Free of charge cancellation is accepted 24 hours prior the arrival, later cancellation will result in 1 overnight penalty charge.